Landowners Fight Border Wall Construction In Texas' Rio Grande Valley A decade ago, dozens of Texas landowners fought the federal government's efforts to build a wall on their land. Those battles are beginning again as new walls are planned for the Rio Grande Valley. 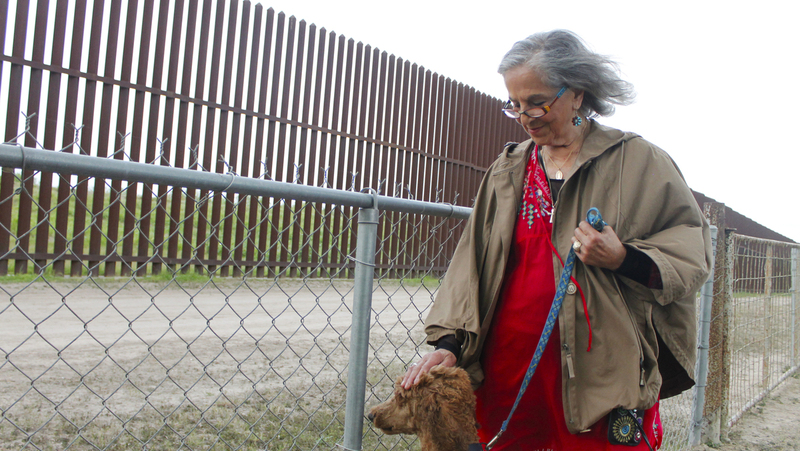 Eloisa Tamez of El Calaboz, Texas, walks along the border wall in her backyard. She took the government to court over surveying her land and over the compensation she received for the land needed for border wall construction. Meanwhile, planning for extending the border wall is already happening in Texas' Rio Grande Valley. "I was notified by two border patrolmen, that 'did I know that my property was in the path of the planned construction of the border wall,' " Tamez said. "I told them I did not know." "Within 24 hours after he gave the order, they built that," Tamez said, referring to the wall that now sits behind her property. "The settlement that I got, which was $56,000," Tamez said. "I converted some of that for scholarships for graduate nursing students." Tamez said she didn't want the money and just wanted her land, without a wall. Tamez's experiences in dealing with the government back then is similar to what other landowners went through — they fought, they lost, the wall was built. "What happened last time ... a lot of people didn't know they didn't have to accept the first offer, so they signed without knowing they were giving up their rights," Olivares said. I'm a big supporter of Border Patrol and Homeland Security and if they say they need it, I think we should comply and give them what they need. "Right now what's planned below the center of town is an 18 feet steel fence," Mayor Salinas said. "We think that would be a detriment to tourism, instead what we would like to see is something more like a concrete barrier built with some decorative fencing on top of it that would enhance tourism." Salinas said the border patrol officials were receptive, but there's no official contract. "Border Patrol and Homeland Security say they need the fence in order to do their jobs. I'm a big supporter of Border Patrol and Homeland Security and if they say they need it, I think we should comply and give them what they need," Salinas said. The mayor said border officials assured him no homes would be displaced during the construction of a new border wall, but he's skeptical because they've walked back commitments in the past. 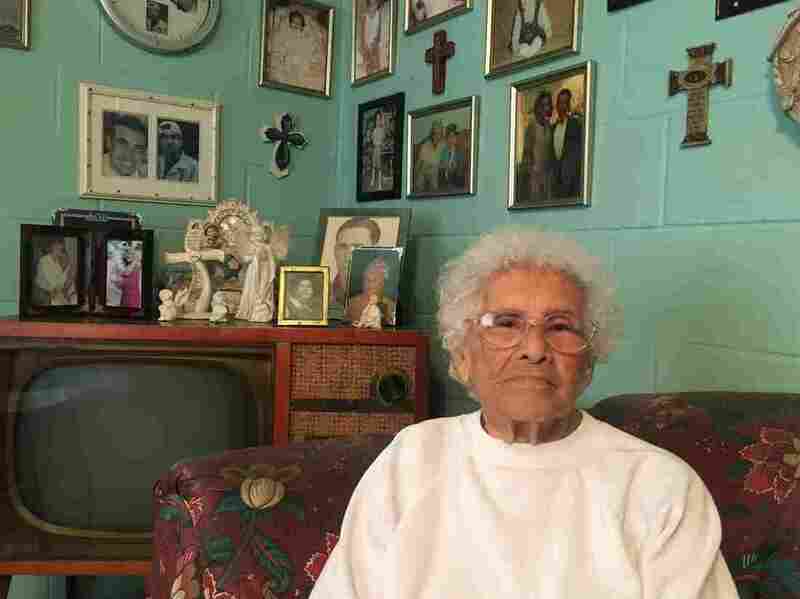 Elvira Canales, 90, in her home in Salineño, Texas. She owns land along the Rio Grande and says she won't sell it or give permission for a wall to be built there, because "its been in my family for generations." She said she recently talked to the Army Corps of Engineers about an upcoming road construction project near her property by the Rio Grande. Canales said she'll take legal action if the government tries to take her land for the road, or for the proposed wall. "I won't sell it, or I won't give it permission because it's my property for generations and generations," Canales said.